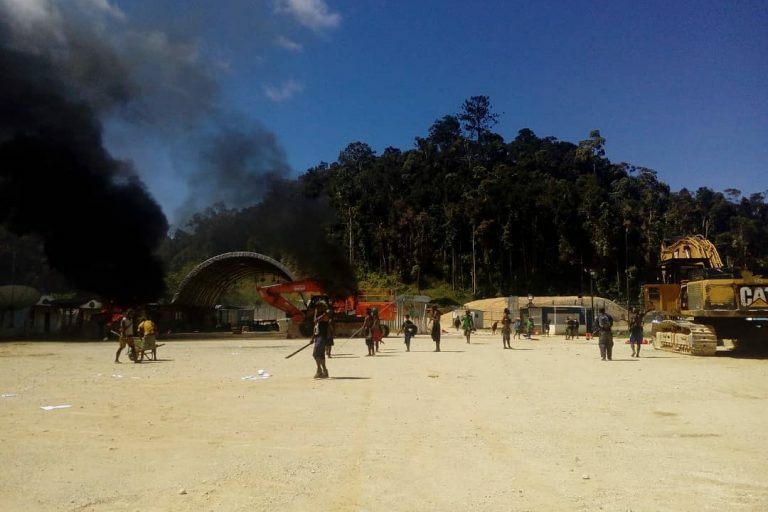 On June 21, heavily armed civilian groups set fire to construction equipment at the ExxonMobil-led PNG LNG project in the Papua New Guinea highlands. 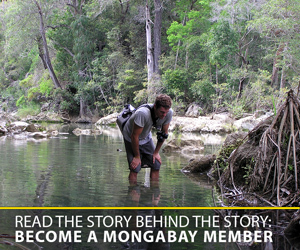 One landowner told Mongabay the people of Hela had “decided to take up arms” because they hadn’t seen the benefits from the project. On June 26, landowners were scheduled to meet at the National Parliament in Port Moresby to negotiate resolutions with Prime Minister Peter O’Neill. 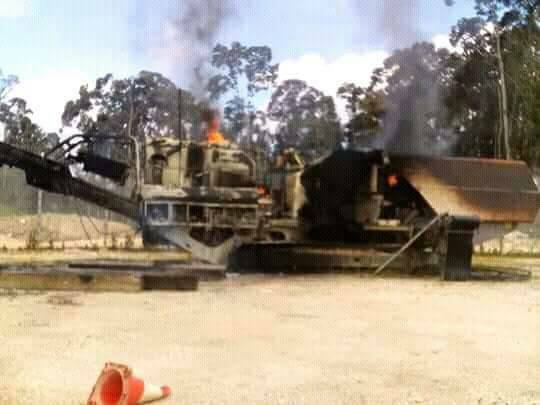 PORT MORESBY — Heavily armed civilian groups have burned and damaged ExxonMobil construction equipment in a land dispute involving a natural gas plant in Papua New Guinea. The civil unrest took place Wellhead A, part of the PNG LNG (Papua New Guinea Liquefied Natural Gas) project. In a statement to Mongabay, an ExxonMobil PNG spokesperson confirmed “vandalism to heavy equipment and some camp buildings,” last week in Angore, Hela province. PNG LNG is the largest infrastructure resource extraction project ever be developed in the country. According to its website, PNG LNG began shipments in 2014. Last year, it produced 8.3 million tonnes of LNG, which it exported to Asia. ExxonMobil PNG Limited is the operator of the $19 billion project. Much of its infrastructure is located northwest of the capital, Port Moresby, in Hela province, and along the pipeline between Hela and Port Moresby. 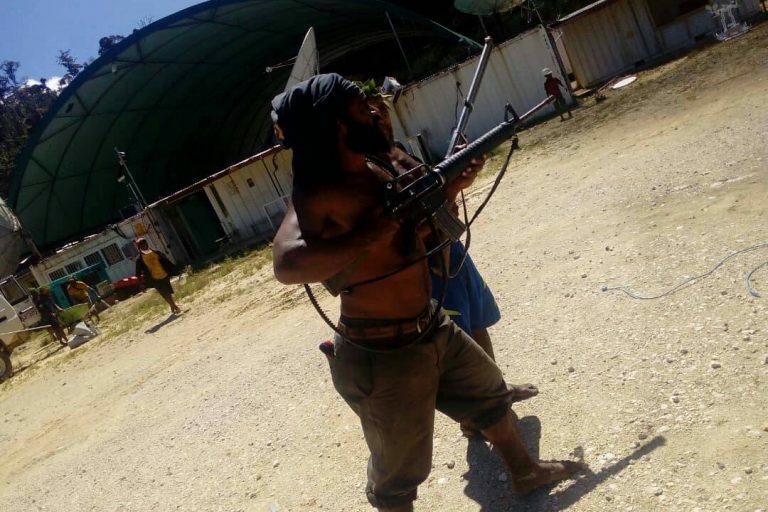 Armed civilian at Wellhead A, part of the PNG LNG (Papua New Guinea Liquefied Natural Gas) project. Image courtesy of the Angore Tiddl Appa Landowners Association Inc. (ATALA). The conflict in Angore centers on the ownership rights of land on which PNG LNG infrastructure sits and continues to be built. 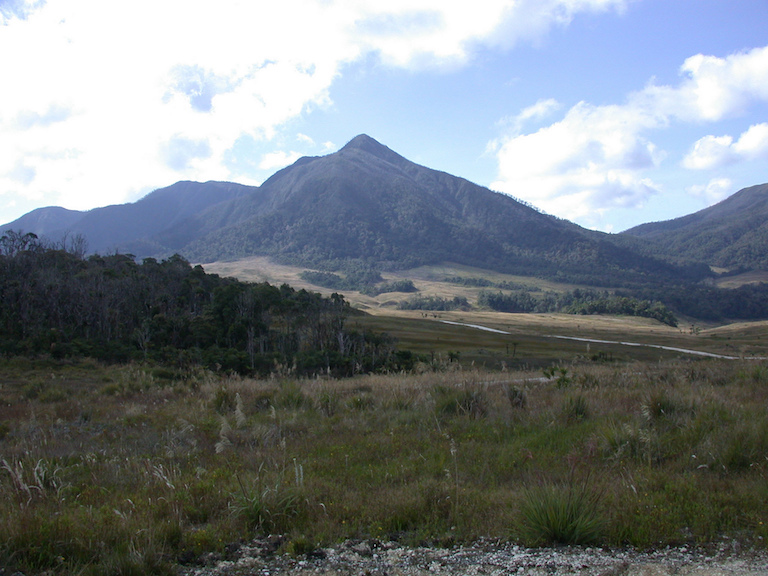 The land tenure system in PNG is “very complex,” said local environmental lawyer Sarah Stocks. In Papua New Guinea, the constitution mandates that 97 percent of the land is “customary owned” by clans, which are generally large, extended family groups. “Before you start any resource development projects, before you even think about commencing some sort of [benefits] settlement, you need to get the prior consent of the land owners,” Stocks said. Landowners in Hela say that ExxonMobil, its development partners and the PNG government failed to follow the required processes to identify landowners, to ensure benefits and royalties were paid on time to the correct people. ExxonMobil previously stated that it had remitted royalty payments to the PNG government since 2014, and that the government was responsible for distributing royalties and other benefits to landowners. The blockade at Angore. Image courtesy of the Angore Tiddl Appa Landowners Association Inc. (ATALA). On June 26, landowners from Hela were scheduled to meet at the National Parliament in Port Moresby to negotiate resolutions with Prime Minister Peter O’Neill. Leading the negotiations are representatives of the Angore Tiddl Appa Landowners Association Inc. (ATALA). ATALA says it represents 150 clans in Hela, numbering some 100,000 people. It says that prior to the incidents in Angore, it gave the government a two-week window to negotiate. In a letter dated June 25, and seen by Mongabay, ATALA says its members consider themselves “custodians” of the PNG LNG gas project. The association says much of the project infrastructure — including the PNG LNG export pipeline and access roads along its route — are on land owned by ATALA clans. ATALA is demanding an “Infrastructure Development Grant” payment of 32 million kina ($9.7 million) by July 1. It is also demanding equity shareholder certificates for traditional landowners in the regions of Angore, Juha, Hides, Komo, Hulia, Hayapuga and South Koroba, as well as to the provincial government of Hela. In addition, ATALA wants the government to reassess the value of the PNG LNG project, and pay 2 percent royalties to landowners every month. Finally, the association has called on the prime minister to provide personnel, funding and equipment to complete official clan vetting for the PNG LNG project. ATALA manager Benson Palijah told Mongabay the people of Hela had “decided to take up arms” because they hadn’t seen the benefits from the PNG LNG project. By damaging equipment and blocking roads, “we have shown our frustration,” Palijah said. Equipment at Wellhead A “has all gone up in flames, it is now burnt to the ground.” But once landowners gain legitimate landownership certificates, the conflict can be resolved “once and for all,” he said. Thousands of people lost their lives in the civil war that broke out in 1988 in the Bougainville region, then part of of PNG’s North Solomons province. That conflict stemmed in part from a dispute over an Australian-owned copper mine. “It just takes one person to be shot. Say one cop is shot, he belongs to a clan — his tribe will then want revenge. And that is how Bougainville happened,” Juffa said. “The [Angore] matter requires urgent and tactful attention of leaders to embark on an immediate conflict resolution process,” he added. So far, the state has responded by sending 200 additional soldiers to Hela province, the governor said. Palijah said the government had also already made an offer to ATALA: a 20 million kina ($6.1 million) payment, to be handed over by July 18. It also asked ATALA to lay down its weapons and reopen the PNG LNG project. “We said no,” Pajilah said. “We rightfully ask for something that belongs to us … We want [this] to end, and not to wait and wait to be certified [as landowners]. We need to be legit landowners of the project, and project partners. In an April 2018 report, the advocacy group Jubilee Australia Research Centre calculated that instead of the promised economic boom, PNG LNG had left the country’s economy worse off than it would have been without the project. “[T]hey think: ‘the politicians are from our province, they are our sons, why are they doing this to us?’” he said. Construction equipment in flames in Angore. Image courtesy of the Angore Tiddl Appa Landowners Association Inc. (ATALA). ATALA says the government did not conduct an accurate and adequate Social Mapping and Landowner Identification (SMLI) process, a mandatory requirement for development in PNG. SMLI processes were not completed before PNG LNG payment offers were made to landowners at a meeting in 2008, Palijah said. However, some landowners did not want to sign, and some who did were ignorant of what they had signed, he added. Others boycotted the 2008 meeting, refusing to sign any agreements and tearing up a second proposal. ATALA “never had an agreement after they tore it up. There was commotion and tension,” Palijah said. Most of the disagreement came from clans whose land was previously undeveloped, and who sought benefits including “roads, bridges, hospitals, medical centres” and a 12 million kina ($3.7 million) grant for social development in return for letting the PNG LNG project be built. The ATALA clans refused to sign the contracts, but 47 people signed fraudulently on their behalf, according to Palijah. “We don’t know who signed, we have no idea,” he said, though he and Juffa speculated the signatories were likely English speakers living in Port Moresby and affiliated with the ATALA clans but without landownership rights recognized by the association. In 2013, according to Palijah, ExxonMobil “bulldozed through everything,” based on the agreement with the 47 signatories. “We did not sign […] and did not expect [ExxonMobil] to come in to our land. When they came, ExxonMobil said the land belonged to the state,” he said. Juffa said that, in the rush to meet the project’s financial investment deadline, there was “no oversight to check [SMLI] was being done” adequately by either the state or ExxonMobil. Banner image courtesy of the Angore Tiddl Appa Landowners Association Inc. (ATALA).